I bought the tank used so it had been running a year before I bought it.. I am just not sure why they died.. One looked like he starved to death. 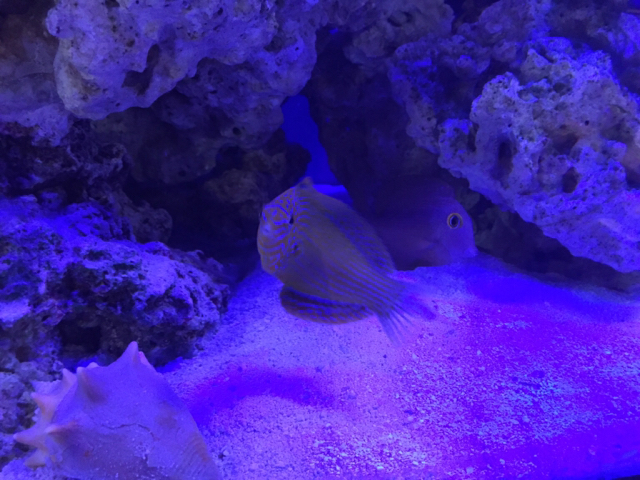 I have a knack for killing diamond gobys and any anemone I put in the tank. All my water levels they say are fine so I think they must be starving. I'm a rookie so I really don't know. Nice work jt...looks like it is going to be awesome. The stand turned out really good, as well. flixmaster, sent you a text about your tank. ph # still end 7962? thanks! was building the connecting piece while you and your son were making the table, and reading your post made me wish i had used spray polyurethane! Been there...I'm so glad I've switched over to spraying...so much easier and love the final result. Maybe you can do that on the next project. Very nice.. I am taking my water to the store today to test. I might still have water issues. I left for a week to the coast and I think while I was gone I might have had issues with water levels. 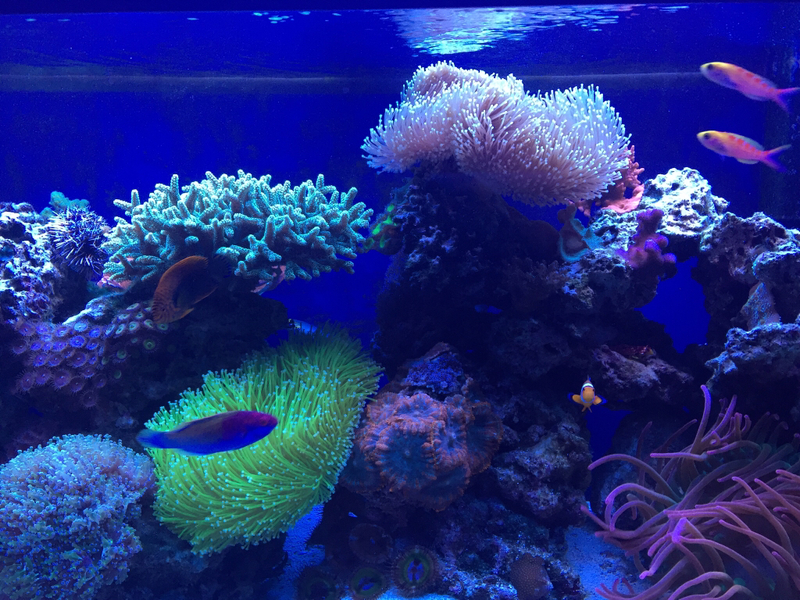 My torch coral was dead when I returned. Nice. 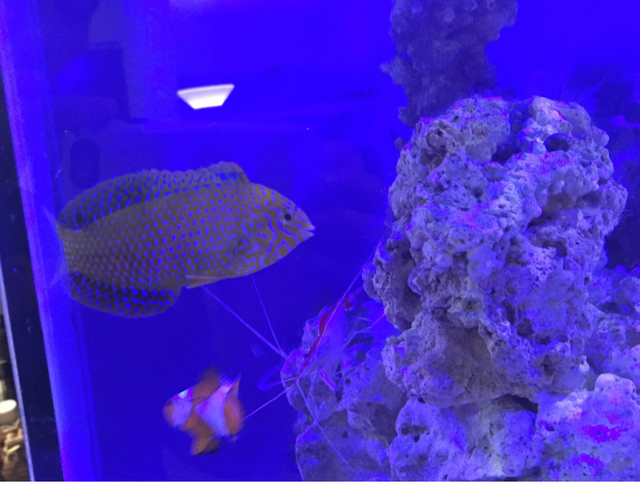 I love the colors of saltwater fish. I have managed to keep most of my fish alive in my tank for over a year now. I have had some casualties. I now have about 5 fish, pistol shrimp/goby buddies, two shrimp, crab, and a number of corals. It has actually been less work than I expected but I am spending way more money in this hobby than I should. 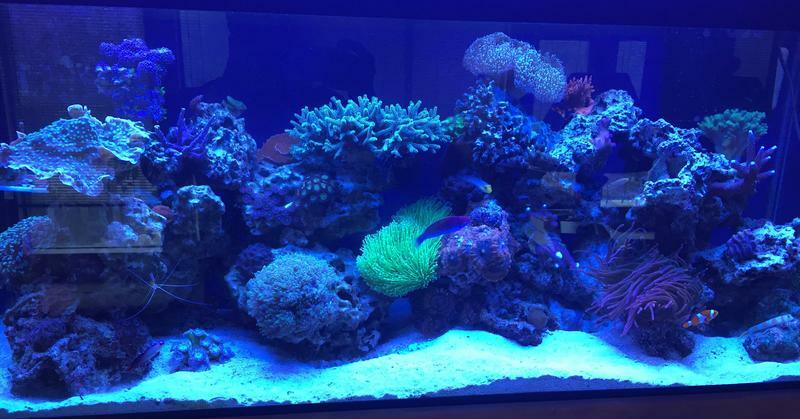 something i've had to come to grips w/ lately is that this tank is pretty much done on the coral front. i'm at 40+ placements and i need to let some stuff grow out before adding anything else. 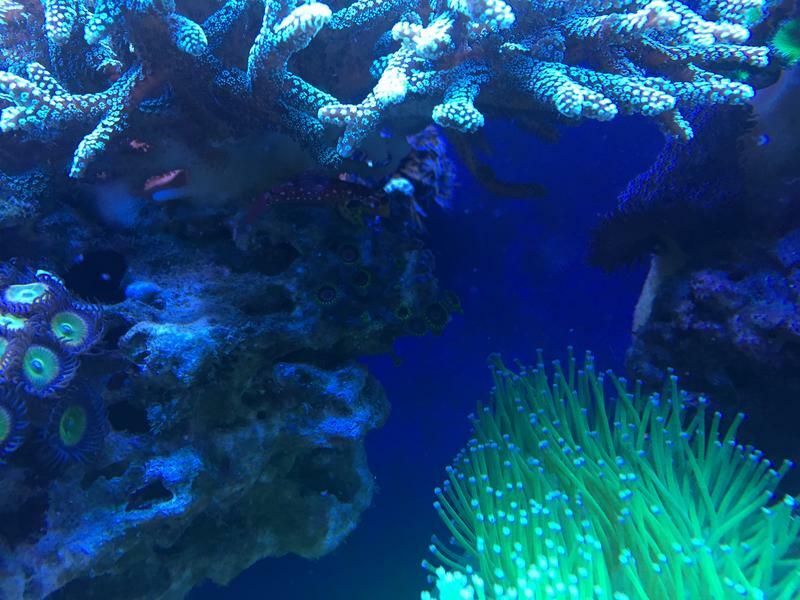 i want to add some sun coral, so i'm saving space for that, and seems like there's 1 more prime location, maybe 2. the rest will be small zoa/monti/shroom stuff, much later. 1	GSP - Almost completely retracted in this shot, the placement on this type of branching rock was perfect (a). 2	Alien Eye Chalice - Growing beautifuly, but is going to be a PITA soon, just because of location. Tough to work around it. 24	Random monti I think might be coming around? 26	?? Palys - spreading fastest of all my Z/P, but not very dense. 31	Neon Green Leather - not sure why it won't grow full cirlce. 34	Fuzzy Blue Mushrooms - b location is 2 heads surrounded by Superman Shrooms that look to be splitting again. Should I just do my best to pull these off the rock? Hard to get hold of them. Just bought a dwarf fire angel for the tank. Hope he makes it thru the week. For some reason the last 3 new fish died. Someone in my tank tormented the blennie fish to death. good luck man - sometimes it's a fuggin mystery and you just can't figure it out. 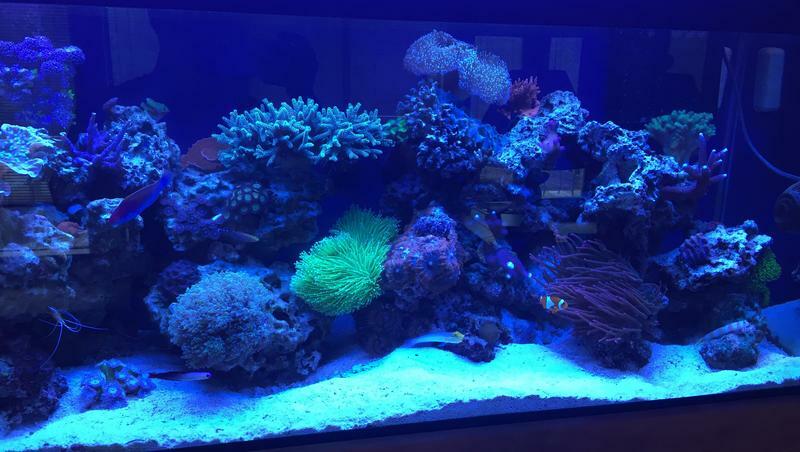 my tank is actually rocking right now, aside from a few minor issues (mostly need to buy a doser to keep my alk consistent). unfortunately the fathead sunburst anthia disappeared shortly after the potter's angel went in. 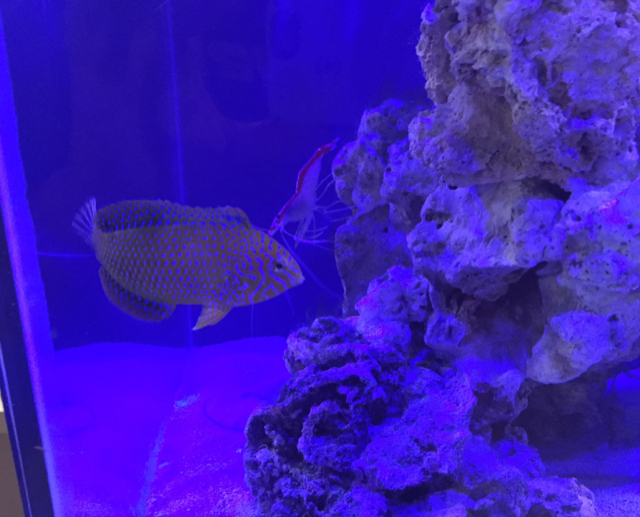 not sure if one had to do anything w/ the other, but it's a bummer to lose a really pretty (and expensive) fish after it's been healthy in your tank for a while. pink stripe goby w/ shrimp - still going strong! 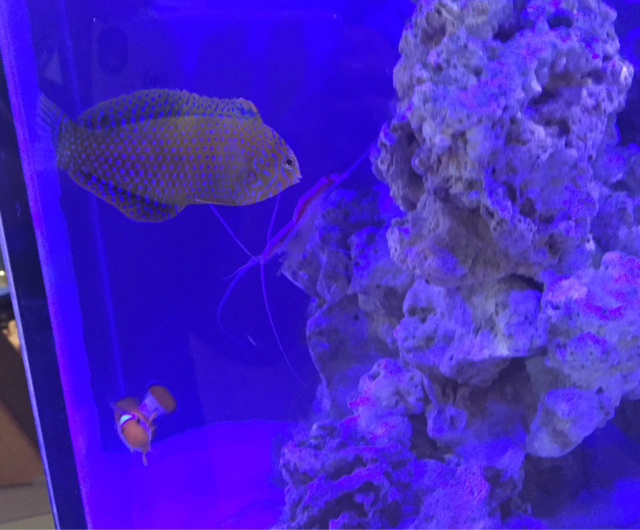 2 tiger anthias - so pretty, just don't have any pics yet. 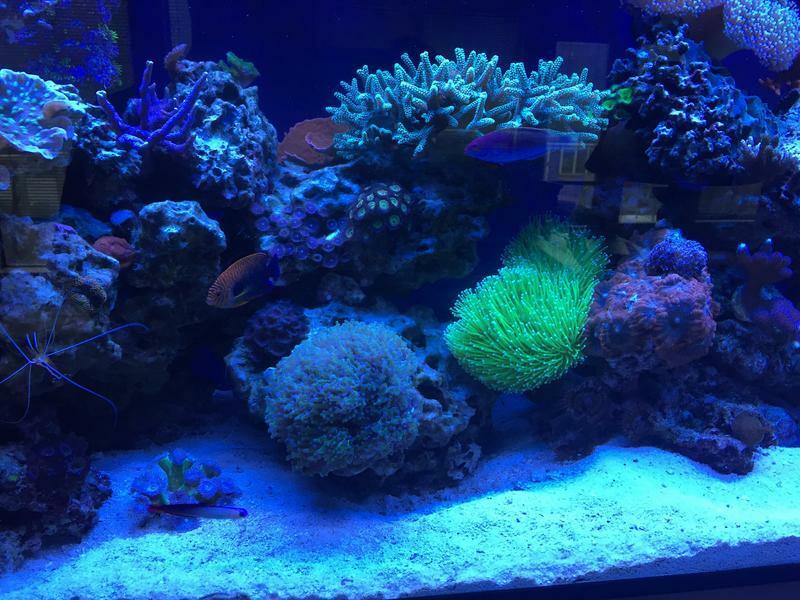 I need more corals to cover all my rock. Are you adding in chemicals for the coals? Or do you not mess with that? i dose alk, calcium and magnesium, but i don't do any of the aminos or trace elements.